Of course the Ankobra Beach Resort is not only reserved for holidaymakers and relaxation seekers. 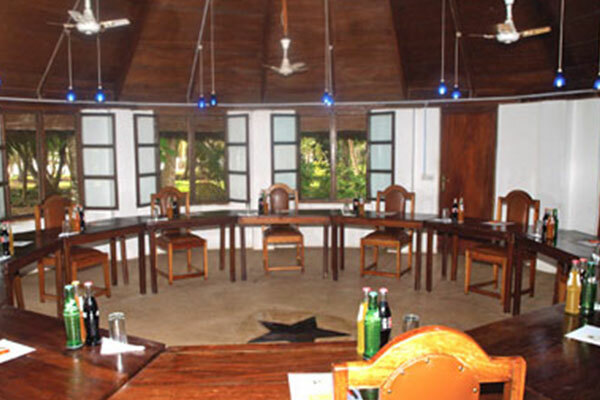 A round conference room at the palm beach with sea view invites you to a concentrated day. Roundtables, workshops, retreats, meetings in an absolute, confidential atmosphere for up to 45 people are possible here indoors – and outdoor for many more people. The circular and friendly architecture of the conference room amidst the palm tree beach is a special feature and underlines the importance of your meeting. Comfortable chairs and attentive service allow you to concentrate on the essentials. You can rent the conference room for half a day or a whole day. Either you pay a fixed room rental or the room will be billed via a conference flat rate and the number of participants. The package includes a half-day or full-day package, including coffee breaks with snacks, soft drinks, room rental, wireless access, projector, lunch or dinner. Experience life in Ghana at close quarters on a 6 km long dream beach, surrounded by tropical flora and fauna, in a lovingly designed and comfortable ambience. The entire 45-hectare complex, the 20 rooms, the social and sustainable engagement for the local population, the food, the service and the quality are here at the highest level of a family-run Boutique Hotel Resort.